Do your kids love mythical fantasy games? They can step right into an immersive, role-playing fantasy world at an interactive family attraction called MagiQuest. The "games and puzzles" are appropriate for all ages, especially teens and tweens who love the magic of Harry Potter. Younger children may find some of the puzzles difficult without the assistance of a parent. MagiQuest was launched by Creative Kingdoms in 2005. 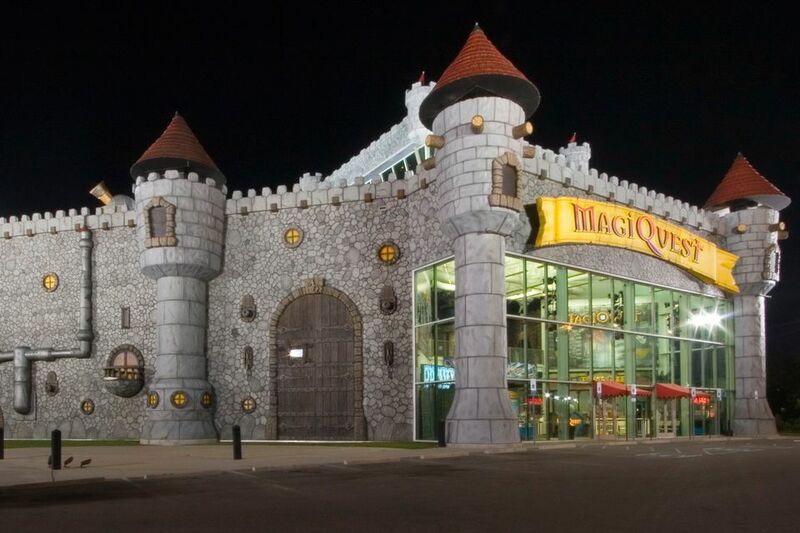 The first MagiQuest opened in Myrtle Beach, South Carolina, the same year. In 2008, Great Wolf Resorts began installing the game in its chain of indoor water park resorts and it became a hugely popular dry activity for kids and families to enjoy outside the water parks. MagiQuest is now wholly owned by Great Wolf Resorts and is a featured attraction at all Great Wolf Lodge indoor water park resorts. The facilities are separate from the lodge and usually consist of four floors of activity space linked with stairs and netted walkways. MagiQuest is a role-playing scavenger hunt-style game. Players (called Magi) embark on quests and adventures in an enchanted world and use a real magic wand to unlock clues and earn rewards in order to solve the mysteries of the game. When you arrive, if you are new to MagiQuest, you'll be sold a wand (necessary for play) and you purchase play time. The wands use infrared emitters to interact with objects in the game. By waving or pointing the wand, a player can activate the object and cause a reaction. For example, a player might point his wand at a door to open it, point his wand at a painting and see the image change, or point his wand at a treasure chest to cause the chest to open and a sum of gold to be added to player's account. Keep in mind that the object you seek might be on the wall, the ceiling, or in a prop such as a painting, tree, or treasure chest. The objective of MagiQuest is to build and gain power by obtaining magic runes, which are rewards for completing tasks. You can get guidance from the Book of Wisdom and gain magic powers to befriend pixies and battle a dragon. When you accept a challenge, be sure to press the "accept" button so that the game will connect to your wand and your tasks will be recorded. Warrior clan members have the power of dueling and wield the power of lightning in their wand. Woodsy clan members have a connection with nature and can summon naturalistic elements and enchanted creatures to help in their quest. Trickster clan members have the gift of magic and often use jokes, magic, or music to distract their opponents. Shadow clan members' strength is the power of deceit. They have the ability to disappear from a place on cue and easily distract their opponents. Majestic clan members have healing powers for themselves and others. You can play MagiQuest for 30 minutes or up to five hours at a time. You can stop a game for a break and return to your quest at a later time. Your magic wand is more than just a souvenir. It connects with an online database which remembers your character, how you play your game, and your past achievements. You can reuse your wand at another MagiQuest location and it will remember your last adventure. If you lose your wand, you can purchase another one and since your data has been stored, the new wand can be configured to connect with your information. You can also customize your game by using special wand toppers to help give you hints or let you fast-forward through adventures. The interchangeable wand toppers easily attach to any MagiQuest wand. Toppers are decorative and incorporate imagery such as unicorns, globes, gems, crowns, dragons, and other mystical symbols.